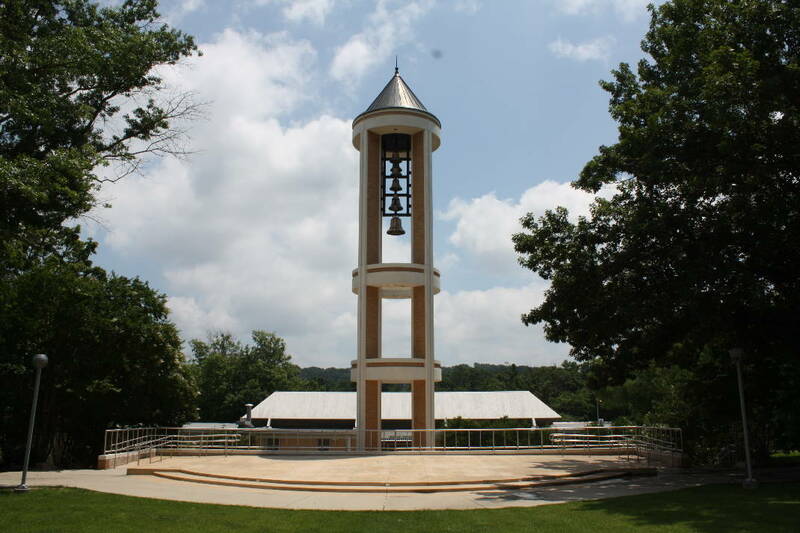 In this July 12, 2013, staff file photo, the James A. Burran Bell Tower is shown in the quadrangle at Dalton State College. Dalton State College is now the first Hispanic Serving Institution in Georgia. The U.S. Department of Education confirmed the school was eligible for federal grants under the special designation Feb. 21, said Quincy Jenkins, director of Dalton State's Hispanic/Latino outreach. The school will hold a celebration of the designation at 3:30 p.m. April 26. To qualify as a Hispanic Serving Institution, at least 25 percent of a college's full-time equivalent undergraduate students must be Latino. The designation, administered by the Department of Education, opens a college up for certain grant programs. These can run from $500,000 to a couple million. "We are super excited about it all," Jenkins said. "It's been hard work for the last few years. Finally, the day has come. Now, the hard work really begins." A wave of immigration to Dalton in the 1970s and 1980s created a large Latino population in the city. Today, that figure sits at about 48 percent, according to U.S. Census data. In Dalton Public Schools, according to the Georgia Department of Education, about 70 percent of students were Latino last fall. As the children of immigrants grow up, their representation on Dalton State's campus has also increased. In 2002, according to Dalton State, about 2.8 percent of students were Latino. By 2013, the figure was up to 19.3 percent. That same year, the college hired Jenkins to reach out to more Latino students, hoping to drive the school above the 25 percent threshold that would make them eligible for federal grants. Jenkins began holding meetings at night with Latino parents, offering information about financial aid programs and creating a good culture for their children to succeed in college. Jenkins also created bilingual materials to educate parents about the school. As of December 2016, there were 416 Hispanic Serving Institutions across the country. Most are in California, Florida, Puerto Rico and Texas. There are no others in the Peach State, though Georgia Gwinnett College had a Latino population of 20 percent last fall. Jennifer Phinney, Dalton Public Schools' director of school support for secondary education, believes the college's Latino population has been north of 25 percent for several years. But she said some Latino students hesitate to put their ethnicity on applications. "Things are kind of messy right now," she said, referring to the national debates over immigration laws, including the Deferred Action for Childhood Arrivals policy. But she said school officials have managed to convince some students that listing their ethnicity is actually good for them and Dalton State overall, helping to push them closer to eligibility for federal funding. She said the Hispanic Serving Institution designation will also encourage even more Latino students to join the campus — the more people from similar backgrounds there, the more likely students will join. "When you have students who are the first in their families in college, there has to be a lot more help available in navigating the whole process," she said. "Application. Financial aid. Orientation. Getting a schedule. There will be more resources to help students navigate through all that." Dalton State can apply for grants that will cover lab equipment, building renovations, staff training, research, extra counselors, extra tutors and an endowment fund. Jenkins said the school's 10-member Hispanic Serving Institution committee will meet monthly through the fall, discussing different grants to go after. He hopes to provide the college's administrators with a plan by October. They will then apply for grants in spring 2019, the next time that the Department of Education is accepting applications. "We have to be there and come with our A-game," Jenkins said.